"Sorry, we can't find that page" is never a message anyone looks forward to seeing on their computer screen. Or is it? Some companies have turned the dreaded error page into entertaining—and even interactive—experiences. "It's a little unexpected surprise that can be memorable, as opposed to forgettable, while keeping people on the site, engaged, and lowering the bounce rate," said Brian Dragich, founder of Bear Flag Branding, which helps small businesses build websites. Dragich finds games and fully interactive error pages to be "a little much," and that the concept takes away from the true purpose of the 404 page. Still, he understands the reasoning behind the trend. "You feel like you've found a secret page that people only visit if they'd made a mistake." This is a classic example of a "good news, bad news" situation. 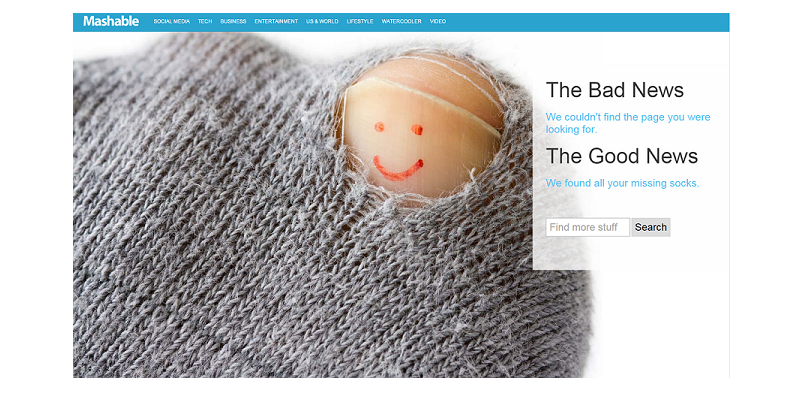 The site's error page reads "We couldn't find the page you were looking for ... We found all your missing socks." 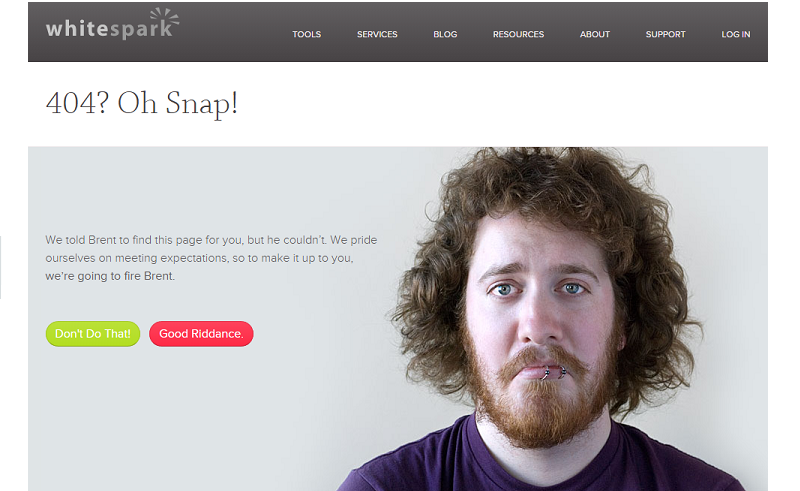 The business card creation start-up's 404 page showcases exactly what Magnt does best. The humorous Venn diagram shows two possible reasons for landing on the site's error page: "we broke something" and "you can't type." Of all the Internet's potential error pages, Web and branding company Bluegg's is arguably one of the most attention-getting. Why? 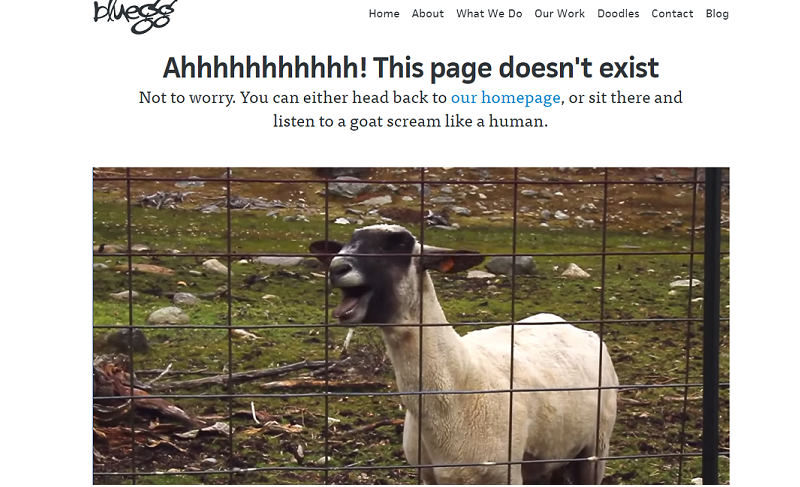 The company's 404 page features a video of a goat screaming like a human. It's no secret that the Internet loves cute animals. 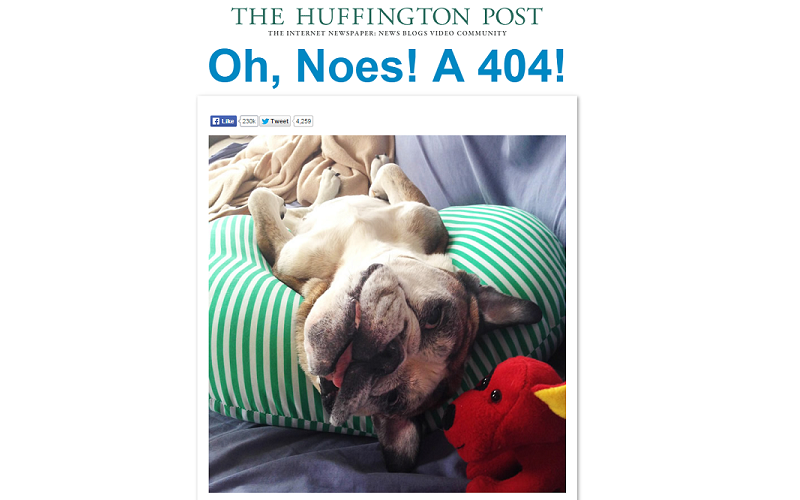 The Huffington Post features this photo of an adorable dog, lying on its back underneath the words "Oh, Noes!" Immediate Internet win. 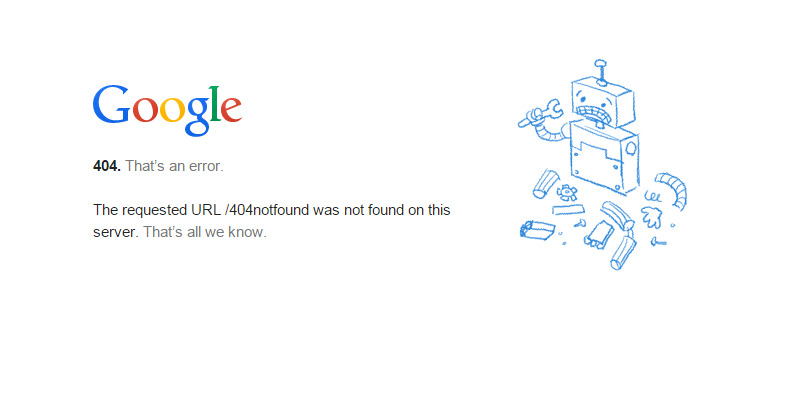 The beauty of Google's 404 page is in its simplicity. What better way to convey "this webpage isn't available right now" than with a confused, broken robot? 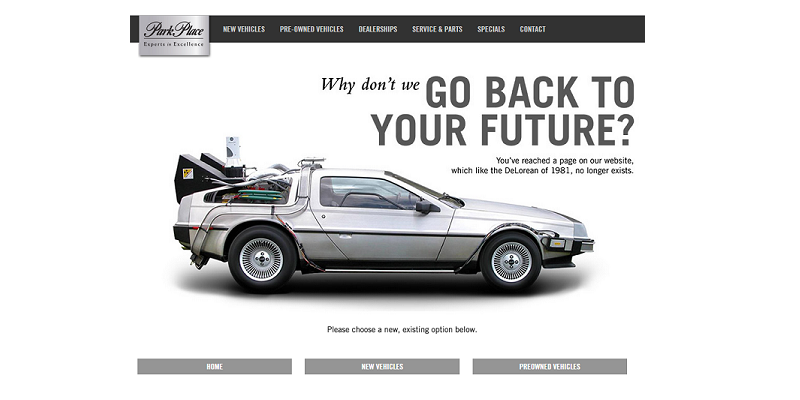 Car dealership Park Place utilizes the iconic "Back to the Future" DeLorean on its 404 page. It reads: "Why don't we go back to your future? You've reached a page on our website, which like the DeLorean of 1981, no longer exists." This digital agency will put visitors on the fast track to procrastination. 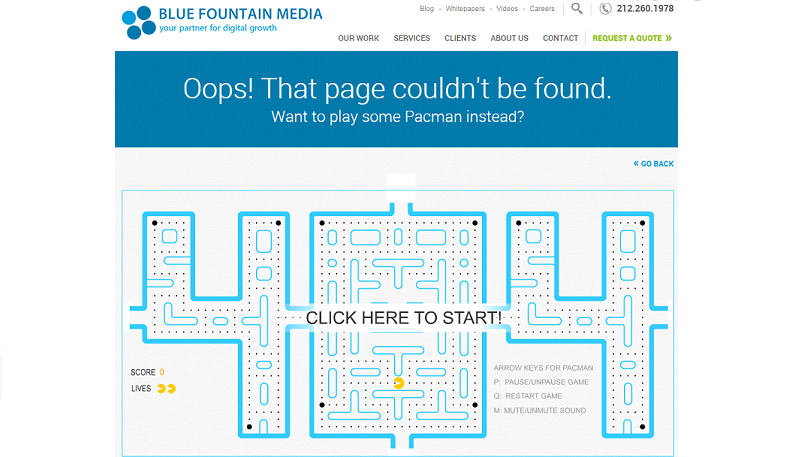 Upon arriving at this company's error page, users will be asked "Want to play some Pacman instead?" The site's visitors can choose to play a version of the iconic 1980s video game, shaped appropriately in the numbers "404." Social media management company Hootsuite uses its mascot—a wide-eyed owl—on the side of a milk carton to tell users they've reached a dead end. 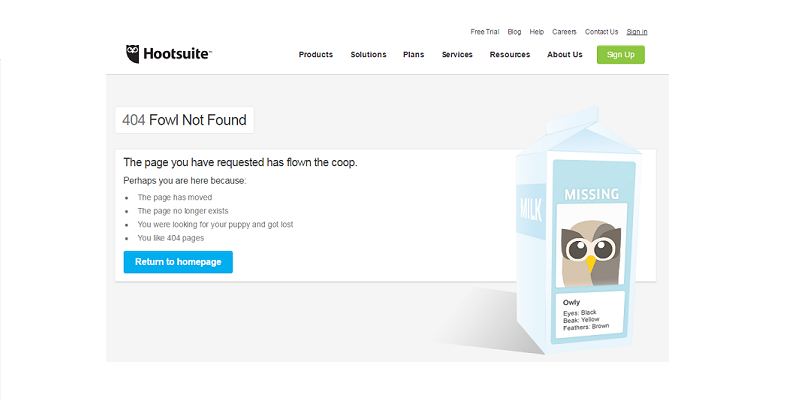 "The page you have requested has flown the coop," says the error page, titled "404 Fowl Not Found." It goes on to provide different reasons one might have landed on the page, including "You were looking for your puppy and got lost." 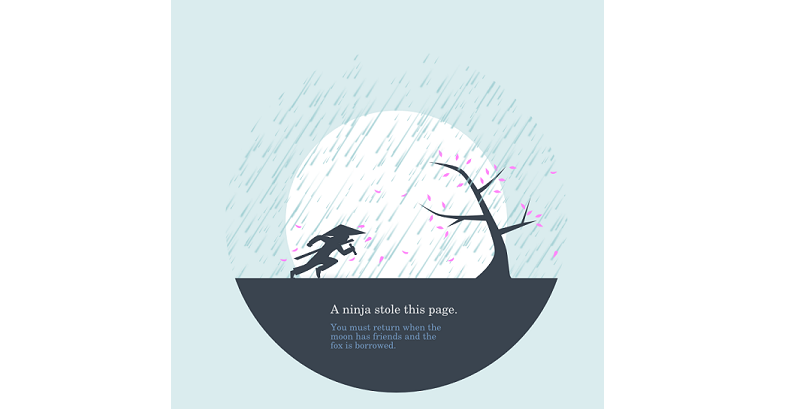 While many sites on this list chose to create elaborate designs or crazy animations, Australian design company Huwshimi and Friends simply claims that a ninja stole the page you were looking for. "You must return when the moon has friends and the fox is borrowed," the site recommends on its error page. It looks like somebody pulled the plug on this page. Lego uses its popular characters to make a simple and silly joke about the broken address. Poor Brent. Because website and SEO company Whitespark "prides [itself] on meeting expectations," it is giving any user that lands on an error page the ability to fire a company employee named Brent. 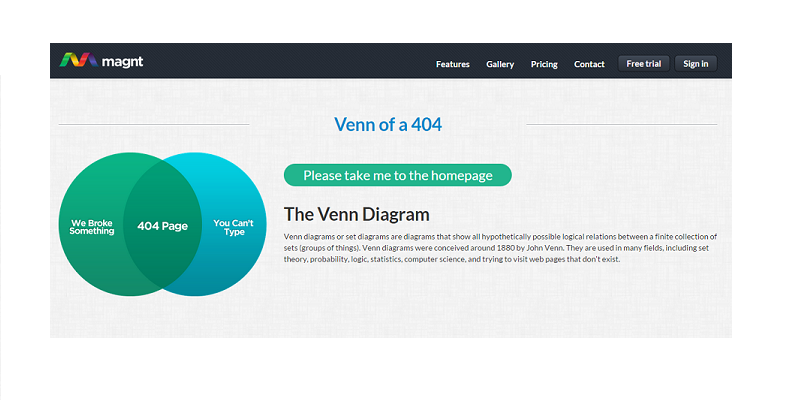 After landing on the 404 page, the visitor has two options: "Don't Do That!" or "Good Riddance." Incidentally, if you choose to fire Brent, the next page will read "Thanks For Firing Brent! His many children will now be going hungry in the streets, but at least the chances of your being inconvenienced have been slightly reduced!" 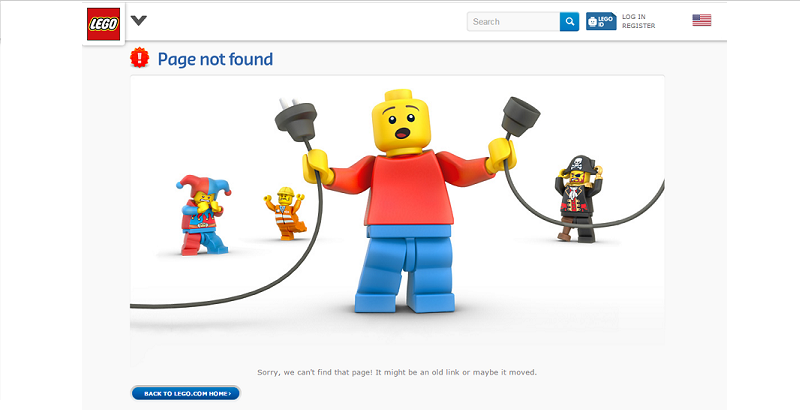 Mattel's 404 page is another prime opportunity for procrastination. 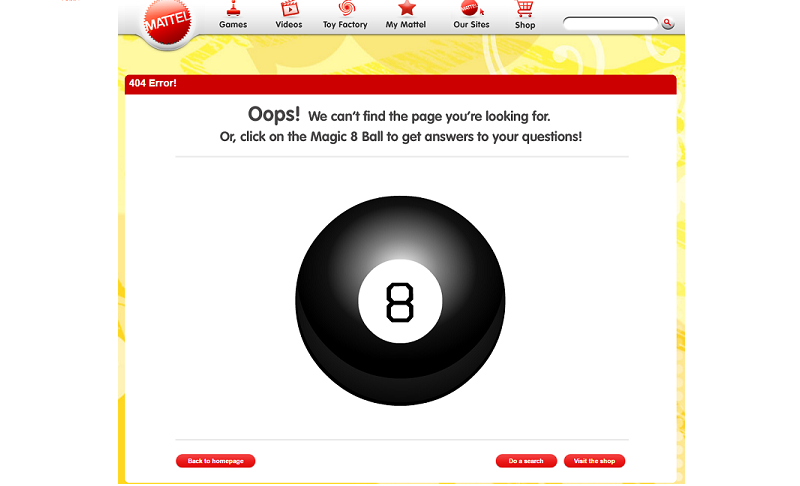 The toy manufacturer greets users with an interactive Magic 8 Ball "to answer all [their] questions." 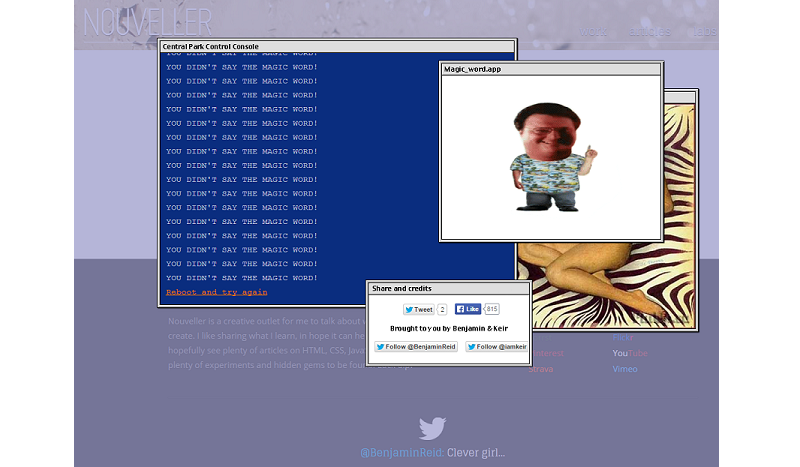 Possibly the most time-draining of error pages is the one appearing in the beginning of the hit film "Jurassic Park." The clever designer behind Nouveller, Benjamin Reid, chose to replicate it. After arriving at the site's error page, the window for the "Central Park Control Console" will pop up to inform users that Jurassic Park's security system is offline. A small green cursor flashes, awaiting instruction, and responds with "permission denied" to anything that is typed into the box. Once access has been denied a few times, the film's iconic "You didn't say the magic word" screen will appear.